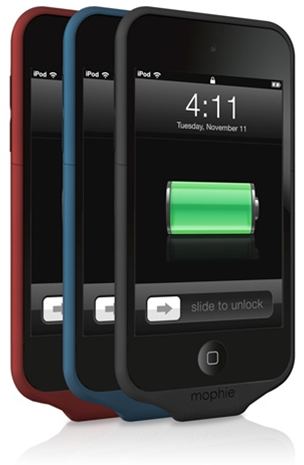 It was a long time coming, but long at last Mophie has released their popular Juice Pack Air battery case for the iPod Touch 4G. It's the first of its kind to nearly double the iPod Touch 4G's battery life using the internal 1000mAh built-in battery, all in an ultra-slim, light-weight form factor. You can charge and sync your iPod Touch 4G with iTunes with the supplied (most likely micro-USB) cable while still inside the Juice Pack Air case. It's available right now in three soft-touch matte colors for $49.95.